On October 26, 2016, new legislation was signed into law by Gov. 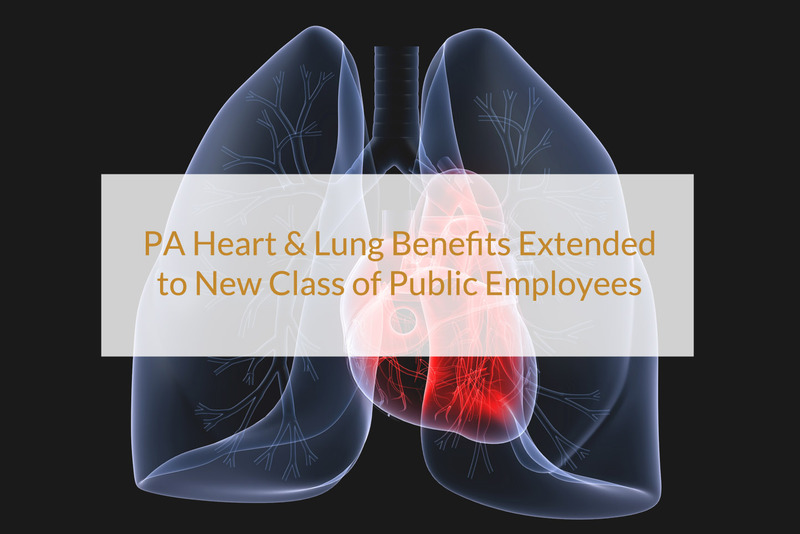 Tom Wolfe that extends Pennsylvania Heart & Lung benefits to a new class of employees. Under this new PA Law Heart & Lung, benefits will now be available to enforcement officers and investigators of both the Pennsylvania Game Commission and the Fish and Boat Commission. Policemen, paid firefighters, and park guards of any local government. LCB enforcement officers and investigators. Correction officers in the Department of Corrections. Psychiatric security aides in the Department of Human Services and the Department of Corrections. Members of the State Capitol Police. Parole agents and enforcement officers of the Board of Probation and Parole. Drug enforcement and special agents in the Attorney General’s office. Delaware River Port Authority police. Employees that are eligible for benefits under the Heart & Lung Act receive special benefits in the event of a work-related injury. Most significantly, rather than the typical two-thirds payment that is received for work injuries under the workers’ compensation act, eligible employees for Heart & Lung Benefits receive their full base salary while temporarily disabled for a work-related injury. They are also eligible for payment of all necessary medical and hospital expenses for treatment of their injury. At Yablonski, Costello & Leckie, we have been handling these special types of work injury cases for decades, throughout all of Western Pennsylvania. More information about Pennsylvania Heart & Lung benefits can be found in our previous blog post, https://www.ycllawfirm.com/2014/09/15/ten-things-you-should-know-about-the-pennsylvania-heart-and-lung-act/. Employees covered under this law receive a temporary salary, medical and hospital expenses if injured or contract certain diseases while performing official duties. Payments are drawn from money appropriated from the respective employer.